Mama June is unrecognisable after losing 136 kg – see the pics! The reality TV star is literally half the woman she used to be! Mama June is literally half the woman she used to be! 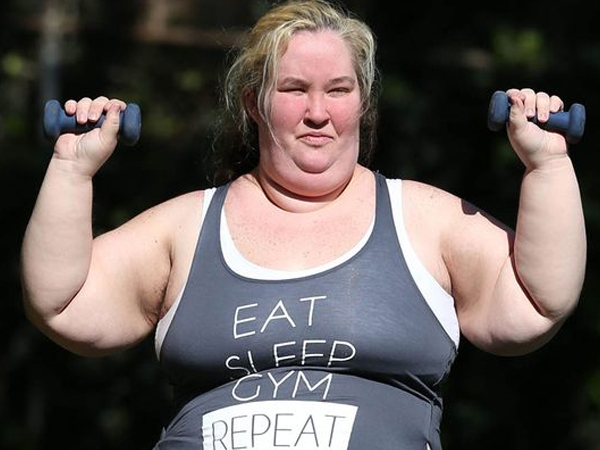 The mother of reality star Alana "Honey Boo Boo" Shannon has reportedly lost close to 136 kgs in less than a year. The 37-year-old, who once tipped the scales at 208 kilos, went under the knife in pursuit of a “revenge body” after her marriage to Mike “Sugar Bear” Thompson ended and he moved onto a new life - and wife - in February. She reportedly had a tummy tuck, breast reduction, and operations to remove fat and skin from her arms and neck - and is said to be down to a US size 4. In a teaser ahead of her big reveal on her new TV docu-dramedy, Mama June: From Hot to Not, the mother-of-four says, "I'm changing my body and my love life. I'm about to start the biggest transformation of my life. This surgery is the scariest thing I've ever done, but there is a skinnier person inside of me." However despite her incredible transformation (she's reportedly down to a US size 4) her 17-year-old daughter "Pumpkin", says her mom still thinks of herself as fat. "I think that her biggest thing [she has to] overcome is that fact that she still thinks of herself as a bigger person, because, even to this day, like, a couple of days ago we had a conversation, and ... she looked in the mirror and was like, 'I'm still fat,'" the youngster shared. "And I guess because she's seen herself as a bigger person all these years, she doesn't realize how small she is." Well we think she looks great!